This homemade banoffee pie is one of our favourite desserts here at Carnation. This is our classic recipe using Carnation Condensed Milk to make a golden caramel and a crushed biscuit base. It’s an impressive party piece and an ever-popular dessert, but it’s also easy to make. 1. 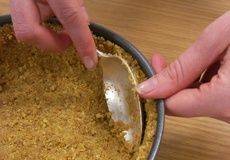 Put the biscuit crumbs in your bowl, then tip in the melted butter and mix it all together. 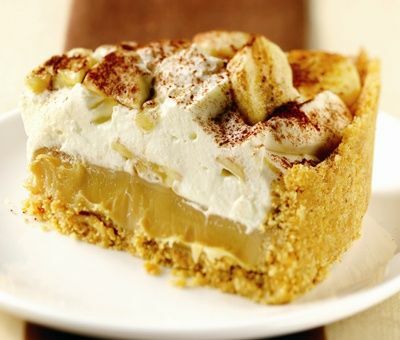 Spoon this into the base and press against the bottom and sides – this is the base of the banoffee pie recipe. Chill it for ten minutes. 2. Place 75g butter and sugar into a non-stick saucepan over a low heat, stirring all the time until the sugar has dissolved. 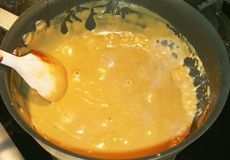 Add the condensed milk and bring to a rapid boil for about a minute, stirring all the time for a thick golden caramel. Spread the caramel over the base, cool and then chill for about 1 hour, until firm or until ready to serve. 3. Carefully lift the pie from the tin and place on a serving plate. 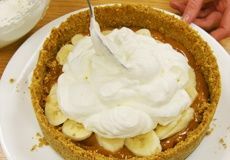 Slice the bananas; fold half of them into the softly whipped cream and spoon over the base. Decorate with the remaining bananas and finish with dusting cocoa powder on top or use grated chocolate to decorate the pie! • Base too crumbly? Make sure you use a buttery spread which is minimum 70% fat or use butter. Or warm the buttery/biscuit mixture briefly in the microwave which will help it stick together. Make sure it’s well chilled before you go to the next step. • Caramel too runny? It didn’t get hot enough… The mixture has to bubble for 1 minute until its starts to thicken but not more than that or it could catch and go grainy. • Caramel is too thick or grainy? It got too hot… Always use a non-stick pan, keep stirring so it doesn’t catch and use a timer. Recipe contains gluten and milk. * GDAa are guidelines. Personal requirements vary depending on age, gender, weight and activity levels.